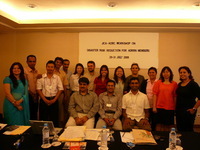 The ADRC, with support from the Japan International Cooperation Agency (JICA), conducted the second year of the "NGO Training for Disaster Risk Reduction in Asia" Project from 29 to 31 July 2008 in Kuala Lumpur, Malaysia. The second year program consisted of a three-day workshop during which first-year participants had a chance to share their experiences in their own countries and the knowledge they gained from the first year program with other Asian Disaster Reduction and Response Network (ADRRN) members. It was attended by six first-year participants, six new participants, and three resource persons from ADRRN members, an officer from the ADRRN Secretariat, and two researchers from the ADRC. During the workshop, participants discussed and shared their opinions on various topics including community-based disaster risk management, disaster risk reduction tools (town watching), climate change, and gender issues. For more information, please visit the ADRC website (http://www.adrc.asia/highlights/NewsNo185).